I went to the Korean American Association of Greater New York Gala Dinner and received an honorary membership to this 52 year old organization. In the little thank you message, the one thing I hope they heard from me was that the Korean Americans in the audience no longer saw us as orphans or children. Reading this was followed by a crowd rousing speech by Congressman Charles Rangel. Wondering why this man gets so much love in the Korean American community in NYC? He is a Korean War Veteran. On this night, he wore it proudly and toasted the table of veterans who really made their presence known with cheers and a shouting toast standing up with salutes. The whole room stood up and applauded them too. I could not stand up. It is with mixed feelings I gaze at Korean War veterans. The running joke amongst the first generation of Korean adoptees is ” I wonder if any of them is my birthfather?” Terrible, I know, but the Korean War and Korean adoption feels like a terrible arranged marriage. There is no doubt in my mind that after reading many versions of the history of Korean adoptions, the presence of these men in that country was a driving imeptus for the creation of the adoption program in Korea. The one and only time I went to the Korean War Memorial was in 1999 at the historic First Gathering of Korean Adult Adoptees. Standing there with 300+ other Korean adoptees and one of my sisters, it struck me that most of us would not be standing there had it not been for this war. It was again, bittersweet. I adore my sister and cannot imagine life without her, and yet looking at all my “brothers and sisters” and hearing their struggles, challenges, hurts and triumphs, I was not convinced it was all for the best. My second run-in with the Korean War Veterans was at an adoption conference many years ago. Stepping out of the elevator to be greeted by a table of veterans that had a box out to collect money “For The Orphans of Korea”, it took alot of work to stop the gag reflex that was convulsing in my body. What timing. A gathering of Korean War vets at the same time and the same hotel as a Korean adoption conference. I am unabashed in my love for this this country, the USA. I also admit to a real admiration for the men and women of the armed forces. In high school, I wanted to go to West Point and serve. I am also fully aware that there is no choice in where anyone gets deployed. 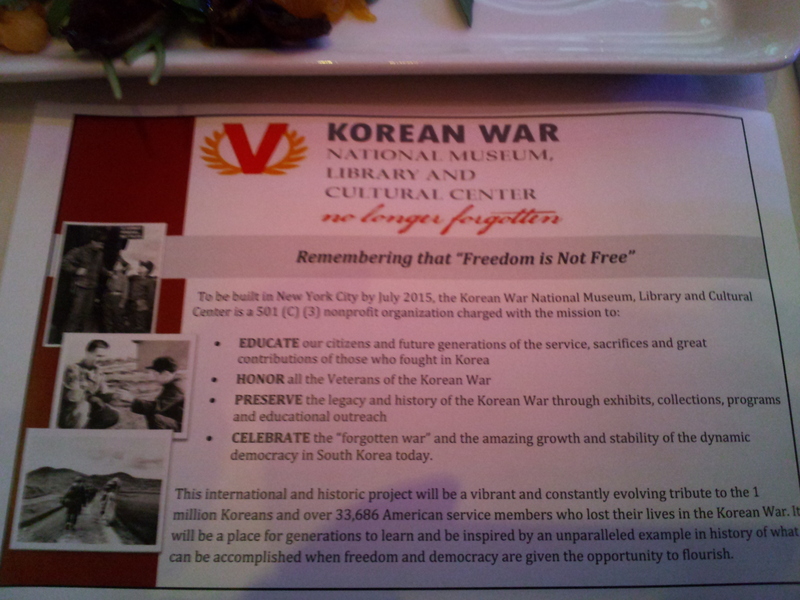 But seeing the veterans at a Korean American organizational event felt really weird to me. I have spent the better part of my adult life striving for the acknowlegement that I am Korean and have very little to show for it. Each encounter with Korean Americans and their organizations feels like work. It feels like self soothing and self serving for these same organizations to put me out there and treat me nicely for one evening never to be heard from again. Over 50 years after the armistice, the Korean peninsula is still divided. I realize it is a generational thing to honor US soldiers. The younger generation does not feel the same impulse to thank and glorify them. But the fact remains that Korean War veterans get the red carpet treatment with well subsidized trips to Korea for them, their children and their grandchildren. And here we are, the remnants of that war still fighting to be recognized as legitimate Koreans paying our own way to Korea to try and salvage memories and create new ones for ourselves, our children and our grandchildren. I am not looking for a free ride here, but it would be lovely to be remembered, welcomed and acknowledged in a similar light. It would be lovely for the Korean government to want to help us reconnect with our history as much as they do for those who created such a complicated history for them. The international adoption issue can leave us feeling compartmentalized in our life. This part of me is American, and this part is Korean. I have not yet integrated these parts. I have met with mixed reception from the Korean American community. Recently, I have felt a warmer reception, an indication that both sides must meet in the middle, and that is all I ask. The veterans’ issue is so complicated for everyone. On the one hand, I would venture to guess most of these men went as youth, not knowing what they were facing, and with no cultural training. They saw and participated in events that left them shocked and uncomprehending. We are adopted from a country out of circumstances that left an entire country divided and torn apart in a way America has not seen since the Civil War. As a Korean adoptee with an American father, I still feel shocked and uncomprehending myself about all kinds of things surrounding my adoption. I, too, feel divided. I am glad to live here, knowing what my future in Korea would have been. I wish fervently that I had a better cultural and family connection in Korea. I keep seeking that balance of understanding what has happened, and how I can be that integrated person in my future. My heartfelt empathy goes out to you. There are many of us out there. You are not alone. Thank you for reading Dawn. I think compartementalization is exactly what we adoptees do so masterfully. Your wishes are completely mine…Thank you for reminding me that I am not alone.